Fly-fishing on the Bow River. The finest fishing in Banff National Park is in Lake Minnewanka, where lake trout as large as 15 kilograms (33 pounds) have been caught. 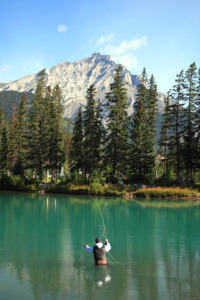 One way to ensure a good catch is through Banff Lake Cruise (403/762-3473), which offers fishing trips in a heated cabin cruiser; trolling and downrigging are preferred methods of fishing the lake. A half-day’s fishing (3.5 hours) is $395 for one or two persons. The company also rents small aluminum fishing boats with outboard motors for $48 for the first hour, then $24 for every extra hour to a maximum of $125 per day. Before fishing anywhere in the park, you need a national park fishing license ($10 per day, $35 per year), available from the Banff and Lake Louise Visitor Centres and sport shops throughout the park.